Hiya guys! I have quite the treat for those of us that can't wait to get our fall season stated with. 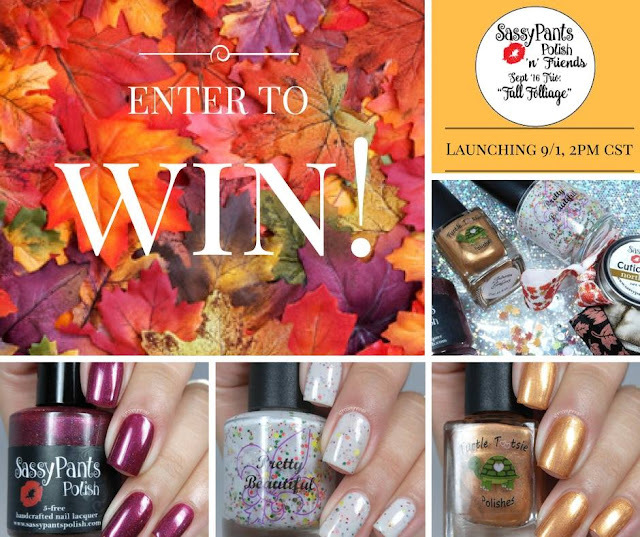 Today I'm sharing the Sassy Pants Polish n Friends September Box, 'Fall Foliage', inspired by the beautiful fall leaves that accompany the autumn season. 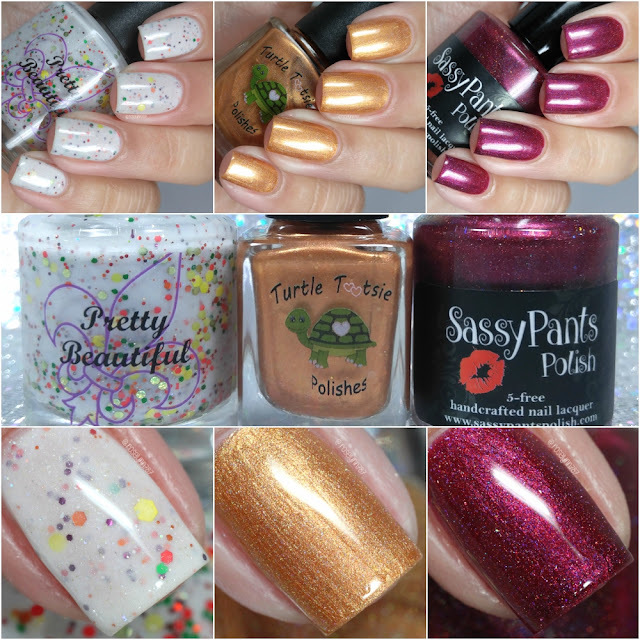 This month we have Turtle Tootsie Polishes and Pretty Beautiful joining in on some fall fun. So get your pumpkin-spice lattes and let's get to the swatches! The Fall Foliage Box will be available for purchase on September 1st with only a limited number of boxes ready to ship! Additional boxes may be opened up as a pre-order. Each box retails for $29.99, which includes US shipping. International is $26.99 plus shipping. Purchases for the box can only be made through Sassy Pants Polish www.sassypantspolish.com. Scroll to the bottom of the post and enter for a chance to win your own box before it's released! Crushed Leaves can be described as a white crelly base with scattered holographic and micro-flakies medium to micro-dot and hex glitters in red, orange, yellow, green and garnet. White crelly polishes are always a favorite of mine, but it feels like forever since I've worn one! I have to say the namesake of this polish really shines through in the glitter combination. Absolutely love it! Shown in two to three coats and sealed with a glossy topcoat. As with every box we receive some goodies from each maker! 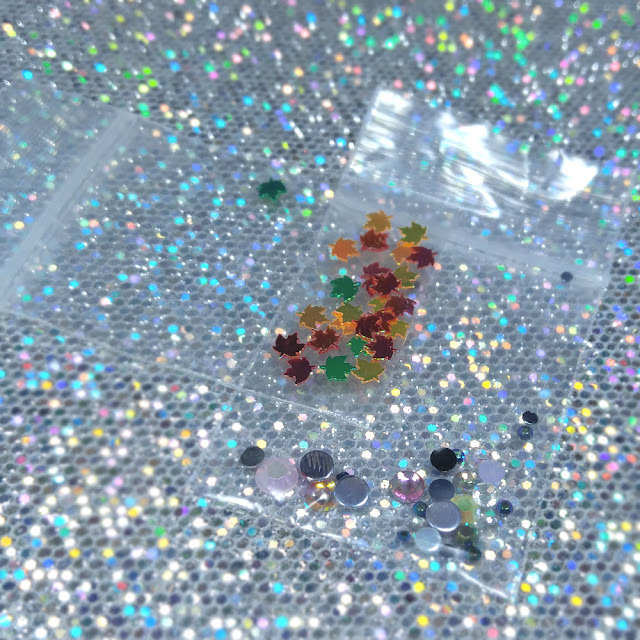 Pretty Beautiful included some fall leaves and gems for nail art! These are so adorable and perfect to pair with any one of the polishes too. Autumn Embers can be described as a coppery holographic polish with gold flakies. 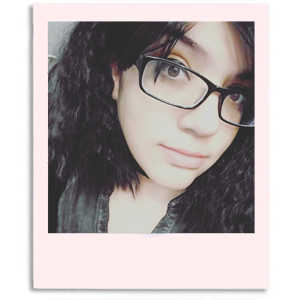 Talk about a pleasant surprise, this shade looks so good against my skin-tone and that is not something that happens often. Holy moly, it's so perfect! The formula has a nice consistency, a little sheer but it builds up nicely. There are some minimal brush strokes, but most get blended out after topcoat. Shown in two to three coats and sealed with a glossy topcoat. These are some cute fall-print hair ties from Turtle Tootsie Polishes. I have to say these couldn't have come at a better time for me as I had just lost my last set of hair ties, haha. Seriously a girl can never have enough hair ties... or obviously polish. Crimson Cranberry can be described as a rich cranberry linear holographic polish. Inspired by the vampy color of fall dogwood leaves. I know I say this a few times when it comes to holos, but my photos really do it no justice. There is so much more sparkle in person! Great formula and nice opaque application. Plus I experienced no staining from this shade even when worn without a base. Shown here in two coats and a glossy topcoat. Overall this box is probably one of my favorites so far from this monthly series since probably the first. The autumn theme was completely nailed (no puns I swear haha) by each one of the makers! I cannot even pick a favorite among them, because they're so different but so spot-on for the season. But there is some bad news to share for those of us who look forward to the Sassy Pants 'n' Friends Box every month. September will be the last box for a little while as Angie, creator behind Sassy Pants Polish, preps for Polish Con and the upcoming holiday months. With all that in mind, you need this box guys! Yes, I'm being a total enabler. But if you're as pumped for the season change as I am then this box will get you even more hyped. To recap, the Fall Folliage Box will be available for purchase on September 1st with only a limited number of boxes ready to ship! Additional boxes may be opened up as a pre-order. Each box retails for $29.99, which includes US shipping. International is $26.99 plus shipping. Purchases for the box can only be made through Sassy Pants Polish shop www.sassypantspolish.com. What a beautiful trio! These play so well together too! Super cute, I love the extras! What fun fall colors. Love this trio. What a fun trio and I love the extras! Thanks for the reminder of this! They box is lovely. I love this box and the little additions from each maker! you look so good in vampy wines.